“History is a matter of honesty. To understand Oslo, one has to have a wider perspective.” These are the words of Kenneth Levin, a clinical instructor in psychoanalytic training at Harvard and a Princeton-educated historian. This book is a major endeavor of using both psychoanalytic and historical methods to explain the Oslo phenomenon. Levin follows the proponents of each of these tendencies throughout modern history. On the one hand, there have been Jews who were secure in their identity, proudly took part in Jewish communal life, believed Jews should control their destiny, and worked to fulfill Jewish national aspirations in the form of Zionism. Examples include Theodore Herzl, David Ben-Gurion, and Aharon Megged. On the other hand, there have been those who identified with the dominant population or culture, rejecting “Jewish particularism” in favor of universalistic ideals. Examples of this second category include the Sulzberger family of the New York Times, Judah Magnes, Martin Buber, Shimon Peres, and Yossi Beilin. Generally, acceptance of the prevalent trend has helped members of this group reach positions of distinction and influence. The relations between the two groups are not characterized by dialogue. Instead they have tended to be in confrontation, with the universalistic side working to undermine communal and national feeling. Recent scholarship has pointed to the importance of interdependence and trust for the health of societies. It is especially this form of social capital that the universalists, in their war against Jewish “particularism,” seek to destroy. In short, those who are identified with the Jewish idea see themselves as belonging to a larger nation, whereas the universalists live and act as individualists in Jewish matters, while seeking to conform to the values of majority society. Levin gives a coherent view of modern Jewry both in the Diaspora and in Israel. Although he does not include the Jewish experience in postwar Europe, it is possible to make extrapolations. From his perspective, the history of the Yishuv and the founding of Israel do not represent an exceptional event but belong to the Jewish historical continuum. His argument here is persuasive, and implies that Israeli history can be assessed by traditional terms of reference. Past history, then, is relevant; there is no drastic new beginning—as, for example, the architects of Oslo wanted the public to believe—and there is no “new Israeli man.” In other words, all aspects of Israeli and modern Jewish history are part of the same whole and are fair game for critical examination. If the medium is the message, then the message of this book is that history matters. Levin has created a framework that enables building on previous pioneering works such as Yoram Hazony’s The Jewish State and Neal Kozodoy’s The Mideast Peace Process. The result is to enhance our understanding of the present and discredit the mindset of the Israeli leaders who joyfully blundered into catastrophe. The Oslo Syndrome reveals the spiritual poverty and intellectual dishonesty of those who claimed past human experience was irrelevant and misled a generation. The book is well written, well crafted, highly informative, and sums up the state of the historical issues. For example, the ninth chapter demonstrates how England, the mandatory power, failed to honor its obligations. Although the Zionists’ efforts to attain a sovereign state are well known, this chapter exposes the destructive attitudes of their Jewish opponents at a time when the annihilation of European Jewry was approaching. The sixth chapter deals with the powerlessness of American Jewry to influence the U.S. administration to adopt a policy of rescue during the Holocaust, and particularly the ineffectiveness of the Jewish leadership. Levin also describes the aggressive role the British played in preventing the escape of Jews from Nazi Europe. Similarly, the well-documented information he presents with regard to Franklin D. Roosevelt is thoroughly unflattering, and he considers the American Jewish belief in this president’s goodwill as delusional. Had Roosevelt survived the war, Levin maintains, he would have emerged as an enemy of the Jews. Similarly, Shimon Peres stated in November 1995: “A leader must be like a bus driver.… He cannot turn his head all the time to see how the passengers feel” (p. 329). This book gives a sober, well-balanced picture of the Jewish experience in modern times, with special emphasis on how the Oslo adventure affected all levels of Israeli society as well as Jews abroad. The discussion of Oslo gives a more candid and complete treatment than what is commonly known in Israel. This work also reconfirms the relevance of the honest treatment of history. 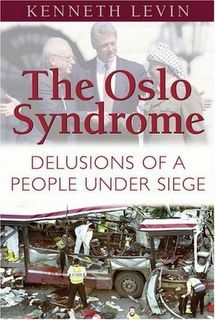 The Oslo Syndrome is not an example of the “new history,” where information is selected and altered to fit in with ideology, but a carefully documented account that follows the facts. Understanding the recent events that are clarified in this book could help in formulating sound public policy, notwithstanding the rootless opportunists who argue that history is merely an obstacle to be disregarded. Not least, a well-educated public in possession of its own narrative is less likely to be taken for a ride by the bus driver of the moment.